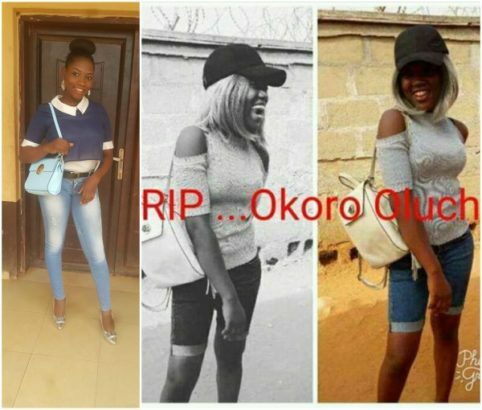 Okoro Oluchi, an English and Literary studies student of Chukwuemeka Odumegwu Ojukwu University, (COOU), reportedly died because she had no I.D card and cash deposit which Amaku Teaching Hospital, Awka, Anambra State, allegedly demanded for. Sarah Kosisochukwu Okabekwa, the late student’s friend however took to Facebook to reveal some behind the scene incidents that happened before her friend died. According to her, one of the doctors on duty was asking he out instead of taking care of her friend. Before I proceed,those COOU students that are using Oluchi to gain popularity on Facebook, even those that never knew her from Adam,those that are saying she couldn’t provide the money requested of her in the hospital, those saying she was asked to provide her school ID card,those saying she couldn’t present her school fees receipt,and even the idiots blaming lecturers for her death and all those spreading false rumor about her death without knowing the actual thing that happened.. GOD WILL PUNISH ALL OF YOU. I never intended writing any thing about this yet,but the kind of false stories I’ve been seeing on Facebook prompted me to. BACK TO MY MAIN STORY. Oluchi came to class on Tuesday morning on a nice black gown,she sat right in front of me and told me she wasn’t feeling too well so after the class,I and a year 2 guy helped her to my hostel so she could have a rest after getting some drugs for her. Around 7pm in the night,I was called by one of my friends (Christophine) to report to the school medicals that Oluchi is seriously sick.I left all I was doing and rushed there, I saw Oluchi lying helplessly on a stretcher. she couldn’t talk,she didn’t notice our presence,I couldn’t hold back tears..the doctor in the school medicals advised that tears wouldn’t solve the problem, that the school ambulance has been arranged, that all we should do was to get her stuffs ready that she has been referred to COOU teaching hospital Amaku that she would get better. We got everything ready and took off to the hospital with Nora,one of my course mates,christophine and Mary_collette who later came to join us in Amaku. we tried contacting her family members but their contacts weren’t going through.We reached the hospital and Oluchi was taken to the emergency unit. Amaku teaching hospital is the worst hospital I’ve ever seen. there is no qualified doctor only the useless student doctors that are looking for whom to use and do practice. One of the rude student doctors asked us to bring the sum of N20,000 before they can commence treatment on her.He never considered we are students and might not have such amount of money. Luckily,I was with my ATM card so we had to trek a very long distance in search of Fidelity Bank around there since other banks weren’t paying. When we got back,they gave us the list of drugs we must buy which cost about N5,500.The stupid student doctors were just after their own pockets and gain not minding the life of my friend at stake. We practically provided every thing they asked us to..but they couldn’t treat my friend. That my friend is dying gradually wasn’t just their business. Oluchi complained she’s not feeling her legs anymore we massaged and tapped the legs all to no avail. I went to report to one of the stupid so called doctor and all he could say was “What do you want me to do”.. Oluchi was in pains we cried and shouted for help but those callous student doctors ignored us. We went to get a card from one of those stupid guys but all he could do was to start asking me out..that I’m beautiful when my friend was dying gradually. I looked at Oluchi and I saw pains in her eyes,I couldn’t hold back tears,I went on my knees and started asking God to intervene. One of my friends asked me to stop crying that she would get better. When the pains was getting too much for her,she started screaming with her last strength “doctor come and save me..I’m dying”.. The stupid doctor came out and replied ” shut up..don’t you see you’re disturbing my patients ” . Oluchi complained she couldn’t feel her whole body again.. We beat and pinched her but she felt nothing.that was when one of the stupid quack student doctors came to take her blood for test but their was no vein in her body. When they saw that Oluchi’s condition was getting critical, they left her and fled. All the quack student doctors in that emergency block disappeared. They left her there to die. Oluchi looked into my eyes and said “Sarah…I love you”.. With tears rolling down my cheeks I replied ” I love you too” and same she said to the four of us in that hospital with her.she asked us to help her tell her parents and family that she loves them so much. She later told us that she couldn’t see any of us again… We started praying for her..If only prayers and tears could bring her back to life. She later said she couldn’t breathe again.. We were begging her not to die. We prayed like we never did in our lives before.. But Oluchi gave up the ghost. She died right in our arms… But we refused to accept she’s dead. We prayed for a miracle to happened. Immediately those monsters that call themselves medical students noticed she’s dead they came with an old oxygen that I’m not sure is still working and started doing incantations on her. One of them came out and told me that their is no need of doing all These that my friend is dead… He broke the news with less concern as if its an animal that died. We cried like we never did before but those heartless student doctors were at a corner laughing at us. It never touched them.. Those guys are so heartless. One of those idiots even had the guts to approach me…asking me to complete the money for her card..I replied him” card for the living or for the dead?”…he said its not his business that he’s doing his job. God! People can be so heartless. Those student doctors in Amaku killed Oluchi. I’ll never advice my enemy to go to that hospital… They are killers. Those student doctors needs to be rusticated. They don’t have human sympathy in them. Immediately Oluchi died they brought an old rusted stretcher that is almost like a wheel Barrow and took her dead body away…like they are taking a dead dog away… No single respect for the dead. One thing I believe is that life is turn by turn. On Tuesday was Oluchi but ,it might be any of them tomorrow. My consolation is that at least I did something for Oluchi before she died. She looked into my eyes and saw care and Love. Heaven knows I Love Oluchi and I did everything humanly possible to save her..but God knows the best. Till we meet to part no more.